The Ecuadorian cacique (Cacicus sclateri) belongs to the family of New World orioles, oropendolas and caciques, the Icteridae. The Ecuadorian cacique is distributed over Colombia, Ecuador and Peru in South America. The cacique species are non-migrant resident birds. These caciques are monotypic. The Ecuadorian cacique (Cacicus sclateri) is a slender cacique, measuring 19 to 23 cm in length and weighing 50 to 60 grams. The Ecuadorian cacique has entirely black plumage. There may be a few yellow feathers on the rump. The tail is long. The bill is long, pointed and whitish. The legs and feet are grayish. The irises are pale blue. There is a pale gray eye-ring. Their call is a loud "peek.. peek.. pio.. pio" sound. The Ecuadorian cacique species are distributed over southwest Colombia, western Ecuador and northern Peru in South America. The Important Bird and Biodiversity Areas (IBA) of the Ecuadorian cacique in Colombia is Riberas del Río Duda. The IBA of these species in Peru is Reserva Nacional Pacaya Samiria. The IBA of these species in Ecuador are, Territorio Achuar, Arajuno-Alto Napo, Reserva de Producción Faunística Cuyabeno and Bajo Napo. The Ecuadorian cacique species have moderate forest dependence. They normally occur in altitudes between 0 to 550 meters. The artificial ecosystems and habitats include plantations, rural gardens and degraded forests. The natural ecosystems and habitats of the cacique species include tropical and subtropical moist lowland forests, seasonal flood plain forests, tropical and subtropical swamps and foothill forests. The diet of the Ecuadorian cacique species consists mainly of invertebrates. Insects, caterpillars, beetles, ants, spiders, fruits and nectar are their primary food. These species are mostly arboreal and moving through the tree canopy, glean insects from the foliage. Sometimes, they forage in pairs or in small family groups. The breeding season of these Ecuadorian cacique species is during January in most of their breeding range. They are believed to be monogamous solitary breeders. Not much is known about their reproduction and breeding habits. These species are non-migratory, sedentary birds. The global population size of the Ecuadorian cacique (Cacicus sclateri) has not been quantified. The overall population trend of the species is reported to be stable. In most of its range, this species is reported to be fairly common (Stotz et al. 1996). The generation length is 4.6 years. Its distribution size is about 323,000 sq.km. Ecosystem degradation, ecosystem conversion, deforestation, human activities in their range are the main threats that may endanger the survival of the species. The Cacicus sclateri species does not approach the thresholds for being Vulnerable either under the range size criterion or under the population trend criterion or under the population size criterion. The CITES (Convention on International Trade in Endangered Species of Wild Fauna and Flora) status is ‘Not Evaluated’ for the Ecuadorian cacique (Cacicus sclateri). 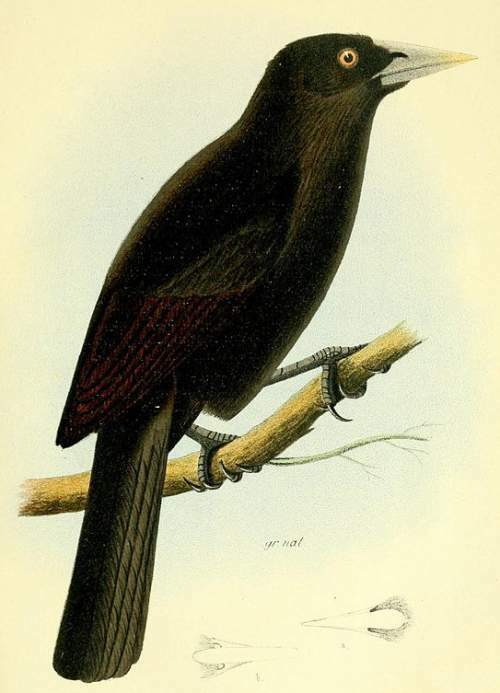 The Ecuadorian cacique (Cacicus sclateri) was earlier placed under the genus Archiplanus. The Cacicus sclateri is closely related to Selva cacique (Cacicus koepckeae). Recently updated and current topic in Bird World: Ecuadorian cacique - Cacicus sclateri.